2. Water fountain for scenic spots can attract large amount of tourists and increase its attraction. 3. The scenic fountain is mainly built in different spaces, like parks, roads, streets, various buildings, rivers, lakes, oceans, tourist attractions, etc. our scenic fountains have different types, like laminar flow, running, dry, bullet, laser, water curtain, rat jump, clock, music score, maze and so on. (1). we use stainless steel material or grade A galvanized steel to make mechanical parts. (2). we choose world famous brands like Schneider, Mitsubishi or Sanyo as electric appliances. (3). we use underwater cables as our cables of water fountain for scenic spots because its quality is in accordance with IEC standard. 1. Flexible delivery time: we have two process factories to deliver goods and one showroom for clients visiting. 2. Long lifespan of the fountain system: our ten patented products can guarantee the long lifespan of water fountain for square. 3. The mode programming system of water fountain for scenic spots can make the water features more stable and neater. 4. Rich installation experiences for overseas market. 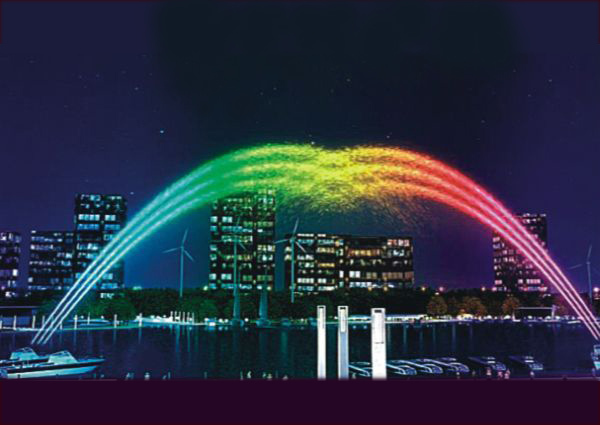 We have finished big scale projects for scenic fountain in Malaysia, Togo, Congo, Nigeria, Ghana, Kazakhstan and Russia. Our workers are paid by actual workdays for 55 dollars each day. 5. Two years of warranty for the pump. LED light system and other parts are lifelong warranty. We will also send engineers to your country to check the water fountain for scenic spots per year. 1. We offer training for our customers. 2. We offer enough spare parts for our customers.